The Spofford Juvenile Detention Center was built in 1957. Located in Hunts Point, behind the Corpus Christi Monastery, this center once held approximately 280 youth. The center included recreational spaces in two outdoor enclosed courtyards, which included basketball and tennis courts, and an on-site indoor pool. The center was permanently shut down in 2011 as the City moved to establish a more rehabilitative model of juvenile justice and was supported by New York City elected officials, activists, and community members—some of whom are actively working on the redevelopment project today. The long-vacant building has been a negative presence and this new iconic development will transform the site for the benefit of the community. 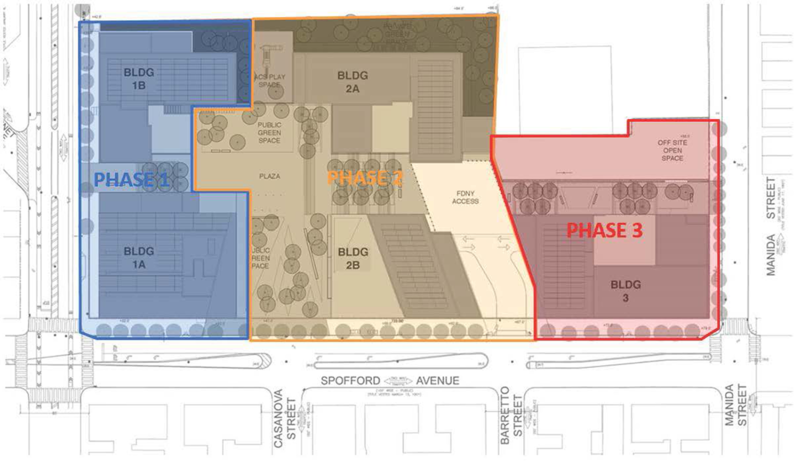 The proposal for the five-acre, $300 million campus features nearly 740 units of 100 percent affordable housing, recreational and community facilities, commercial space, and over an acre of public open space. Additionally, a portion of the site will also be preserved for early education programming that has served the community for more than four decades. Beginning in December 2014, NYCEDC performed extensive outreach with local elected officials, key local stakeholders, and local residents to discuss the priorities for the site. Some of the neighborhood stakeholders included Bronx Community Board 2, BronxWorks, the Hunts Point Alliance for Children, City Year, Youth Ministries for Peace and Justice, Casita Maria Center for Arts and Education, Sustainable South Bronx, and many others. In an effort to transform the site and the broader Hunts Point neighborhood, NYCEDC issued a Request for Expressions of Interest (RFEI) in June 2015. Thanks to the collaboration between the community, NYCEDC, and all other agencies involved, the redevelopment of the site will bring many important resources to the local community and help meet long-standing community needs. The Peninsula, a joint proposal by Gilbane Development Company, the Hudson Companies, and Mutual Housing Association of New York (MHANY), was selected and announced in October 2016. Community sponsors on the development team also include Urban Health Plan and The Point CDC. A vibrant live/work campus and the first-of-its-kind industrial-commercial-residential project, The Peninsula will begin its transformation in spring 2018. The project forges a new model in neighborhood development by embedding quality manufacturing jobs, health and wellness resources, and open space recreation into a new residential development. The Peninsula will support approximately 1,000 construction jobs and create more than 300 permanent jobs throughout its development and operation. The development team has committed to a 35 percent M/WBE goal and will participate in HireNYC, a free NYCEDC program that connects residents and workers to the City's workforce development services for various projects. The former Spofford site will become a mixed-use development that will benefit local residents and bring economic opportunities alike. The expansive campus will comprise a five-building, three-phase project that will provide 100 percent affordable housing for low- and moderate-income New Yorkers; from students to seniors to families. The Peninsula will be anchored by a mix of commercial and industrial businesses, as well as a health and wellness center and educational and job training programs. Many of the anticipated retail, commercial, and industrial tenants are Bronx-based organizations already operating in and around the Hunts Point area. They include Bascom Catering, Il Forno Bakery, Mass Ideation, Hunts Point Brewing Company, Lightbox NY film studio and a 15,000-square-foot supermarket operated by award-winning SuperFi. The Peninsula campus will offer community development and education resources through education and incubator spaces. Specifically, the project will preserve and expand an on-site early education facility. Along with this, it will add a playground, provide higher-education space with career-readiness programming, and offer co-working space designated for small business incubation and technical assistance to local entrepreneurs. Additionally, an 18,000-square-foot health and wellness center operated by Urban Health Plan, a lead community sponsor of The Peninsula, will connect residents to quality primary and specialty health care services and employ emerging health-tech professionals. Located in the Hunts Point peninsula, the majority of the site previously served as the location for the Spofford Juvenile Detention Center for juvenile offenders in New York City (renamed the Bridges Juvenile Detention Center in 1999). After over 50 years of operation, during which the center served approximately 280 youth, the City decided to permanently close it in 2011. The center experienced operational challenges: there were concerns about the treatment of youth and, due to the center's restricted location, it was difficult to access for many of the youth's families. The closing was consistent with the City's goal to transition from a punishment-based system that removed children from their families and community support systems, to a rehabilitative model of juvenile justice. The building has since been managed by the Administration of Children's Services. The Peninsula was approved on March 22, 2018 by the New York City Council.